Mickey Mantle was an absolute icon for fans of the New York Yankees and, indeed, of the entire baseball world, for nearly twenty years. And, his fame spread even beyond the enthusiasts and historians of the diamond. For example, fans of the hit television series “X-Files” will surely recall the banter between Agent Arthur Dales and Fox Mulder in Season 6, Episode 19. In a conversation outside of his front door, Dales questions Mulder about liking the sport of baseball, and then asks this question, "How many home runs did Mickey Mantle hit?" Mulder thinks and then replies, "A hundred and sixty three." As Dales hears this clearly deficient answer and reaches to dismissively close the door, Mulder pushes it open and chirps, "Righty. 373 lefty. 536 total." Everyone knew about this larger-than-life player, and about all of his accomplishments. 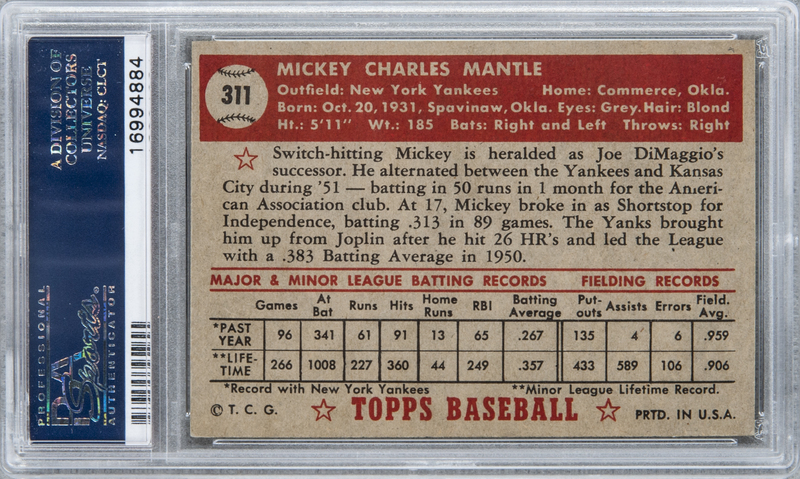 The 1952 Topps production was the largest set of its day, not only in the quantity of cards included, but also in terms of those cards’ physical dimensions. 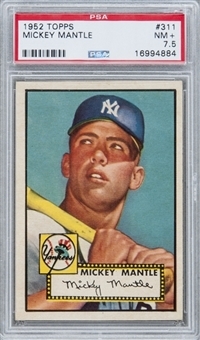 The issue’s flagship entry (which hailed from the sought-after "High Numbers" segment), was Card #311, picturing a young, blonde-haired and blue-eyed rising star of the Yankees organization. And, though this promising phenom suffered a serious injury early in his career, he still played in more than 2,000 games and finished his career with an impressive .298 batting average, while compiling in excess of 1,500 RBI's and rapping out 2,400-plus hits. Graded NM+ 7.5 by PSA. Among more than 1,375 copies recorded in PSA's census reporting, just 44 examples have been placed at a higher tier. This is, without a doubt, the most famous and popular gum card of Mickey Mantle ever issued, and it marks Topps’ first depiction of the Yankee legend. In its portrayal, deep, rich portrait colors blaze against an intense and lustrous azure background. The card’s image boasts incredible registration, and the black-line frame containing the picture is well-centered. The piece's corners form solid right angles, and its reverse is clearly printed and properly aligned. Here, we see one of the most impressive and valuable individual pieces in our entire hobby. This is a true, centerpiece collectible, in strong Near Mint-plus condition.